Def Leppard and KISS continued the Summer Tour 2014 last night in Houston, TX with a 14 song set played. The band played the regular 75 minute set at the Cynthia Woods Mitchell Pavilion. The show started with the live snippet of 'Won't Get Fooled Again'. The rest of the show was the usual set with no changes from Tulsa. This was the final show of the 42 date Summer Tour 2014 with KISS. Joe introduced KISS once again before their set. Joe Elliott end of show speech - "Thank you. Amazing!. What a sound out there. Come on!. As always it's been a pleasure. Until next time and there will be a next time. Do us a big favour. Don't forget us and we won't forget you. Goodnight." 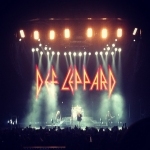 The next Def Leppard show takes place on 4th September in Mexico City.